The FTSE 100 is a favourite of mine and a great index to trade, and it’s starting to look stuck in its current state as markets try and decide its next direction. With positive news overnight for the UK economy, many people are asking what it will take to see a push through the current ceiling that has formed. UK economic data was very positive overnight as markets moved on the news that claimant counts dropped by 25 thousand (less than what was forecast though) and overall, that the unemployment rate fell to 7.1% as the economy added 167,000 jobs over the last 3 months - a figure not seen for 17 years. What is now expected is action from the Bank of England (BoE), as they have commented that a 7% unemployment rate might warrant rate rises in the economy to keep it in check. However, with the notes that accompanied the recent meeting, members of the BoE were in no rush to push up rates, as they were more inclined to see the recovery strengthen further, and the fall in inflation has given them breathing space. The FTSE 100 itself is expected to be more bullish though in the long run, as a strong economic performance equates to more aggressive speculation in markets generally and no more so than in equity markets itself. This is also coupled with greater earning potential in the long run which will give a boost to companies listed on the exchange – though market analysts would have priced this in previously. 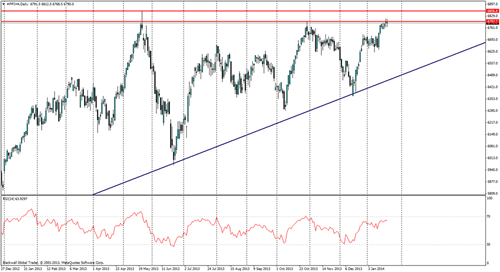 Market technicals show strong resistance formed at 6801.00, as the market looks for a sign to push through or drop lower. For the most part, RSI is also very high, showcasing the strength of buyers in the last few days. However, despite this pressure numerous times, we have seen strong pullbacks after touching this high. Though in the last 2 touches, the RSI was touching the 70 levels, and we have not yet touched these levels just yet, thus implying that further upward momentum could be a very real possibility. Overall though, resistance levels can be found at 6801.00 and at 6857.00, while support levels can be found at 6706, 6652 and 6608. It seems unlikely that any further push higher can happen, seeing as the ceiling has been tested so often and is yet to break. Currently, the S&P 500 and the Dow Jones have all been moving north over this period of time while the FTSE 100 has stopped in its tracks at this ceiling. Overall market sentiment points to higher conditions as being overbought in this current climate, and that many analysts in the market are now expecting a correction. Either way, the short term opportunity is certainly there when markets find heavy resistance and pull back as we have seen time and time again.